But enough about us, it's all about the music. As our hosts, this band always officially starts things off. 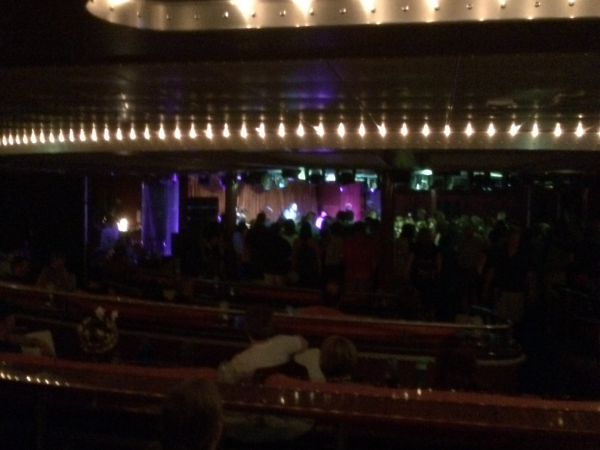 As one would expect, this show included their song "Sail Away." 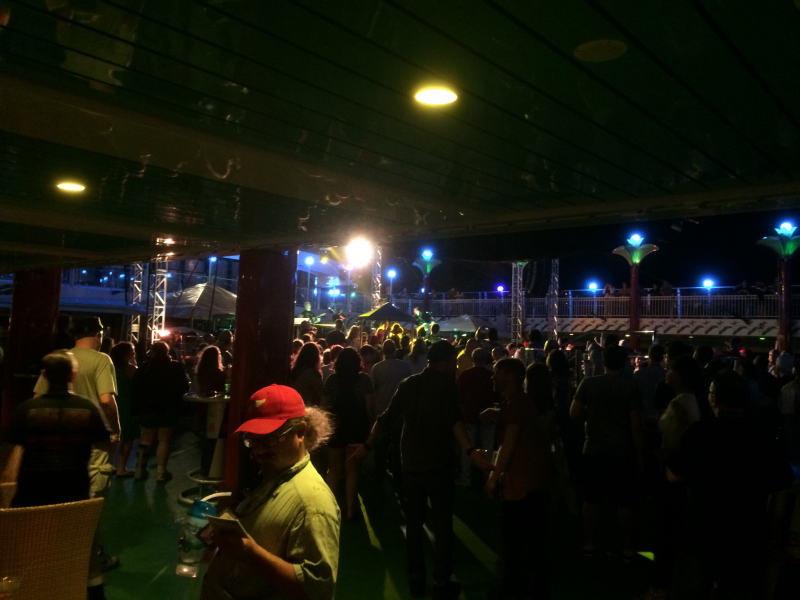 Months before the voyage, there was a Spotify playlist that included a few songs from all of the bands. I had listened to "On the Wire" and "You Know Me," so I wanted to see this band. 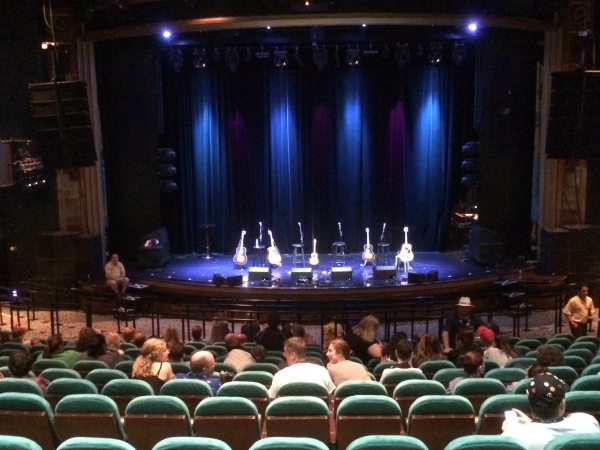 Based on their live show, they were a little more country/folksy than expected. My daughter has been a fan of Gavin DeGraw from the very start — way before he attained a certain level of notoriety. His live show did not disappoint. 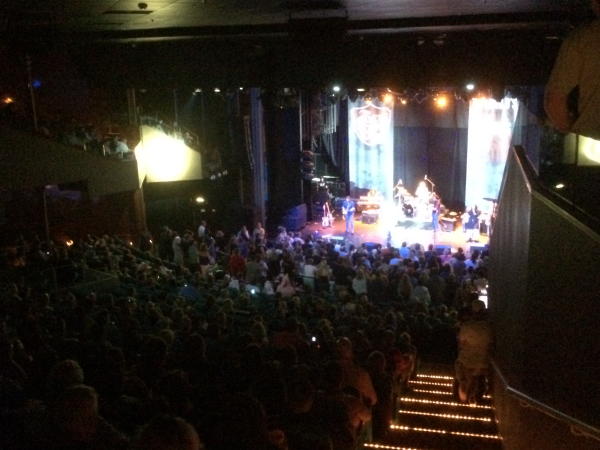 At one point he mingled among all parts of the venue, including the upper section, as he sang. His hits include "I Don't Want To Be" and "Not Over You." 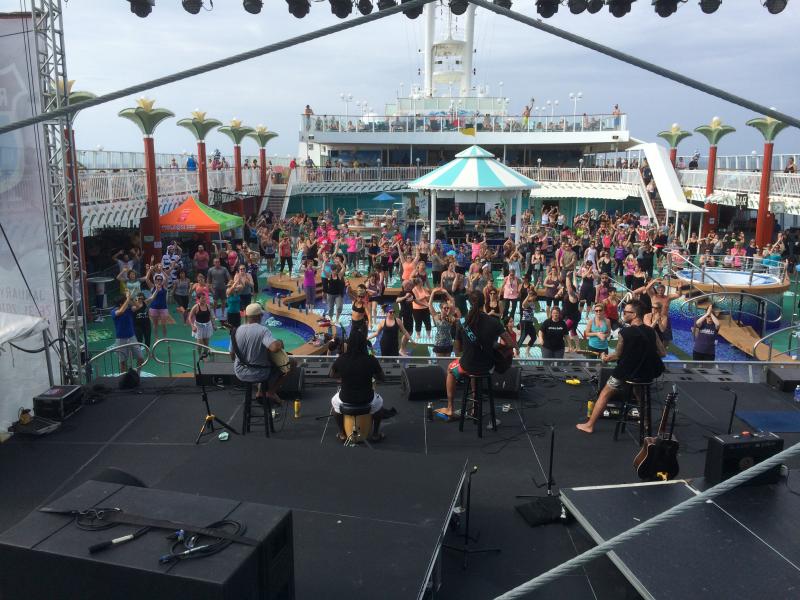 Sheryl and Marie took a yoga class lead by Michael Franti. They loved it. The music was spiritual and soothing — just perfect for the occasion. The stories were great, but the songs were even better. 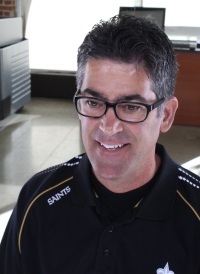 Emerson Hart is the lead singer for a band called Tonic who had a minor hit with "You Wanted More." Vertical Horizon is one of my favorite bands, and Emerson's solo performances remind me of them. I enjoyed his show, but with just one man and one guitar, it was a little low energy. He has a very natural singing voice. From their Spotify song, "Postcard," I wanted to see this trio. Alas, live, they were not my taste. Though I like Queen, I think the keyboard player secretly wishes he was Freddy Mercury. 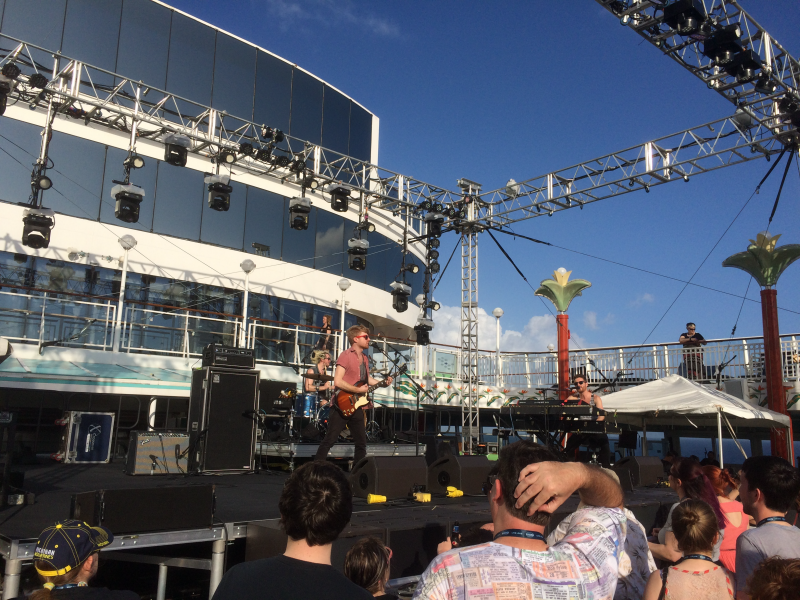 Will Hoge has been a Rock Boat staple for many voyages. He is a sometimes a little more country/Bob Dylanish than I like, but he always puts on a good show. 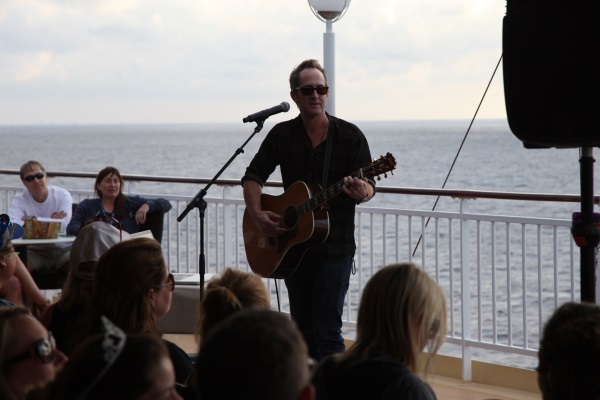 Even though he as up to 4 performances on each voyage, he never plays the same song twice. This band is very popular. They rock. Their hits include "Something Beautiful" and "Multiplied." 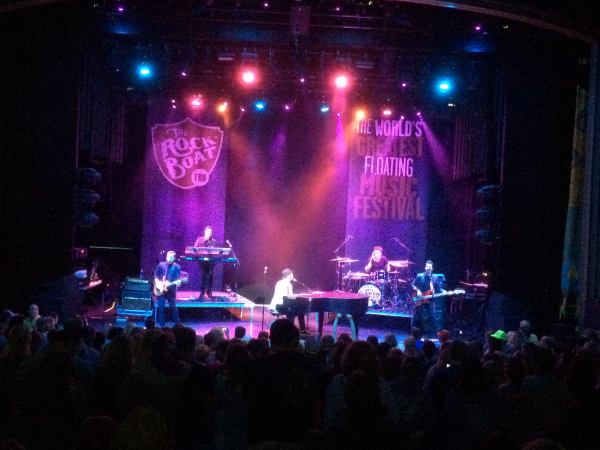 Gavin DeGraw joined them for their encore and performed "Brother" since there is a studio version that features both artists. Each night on the boat has a different theme. This night's was Zombies. 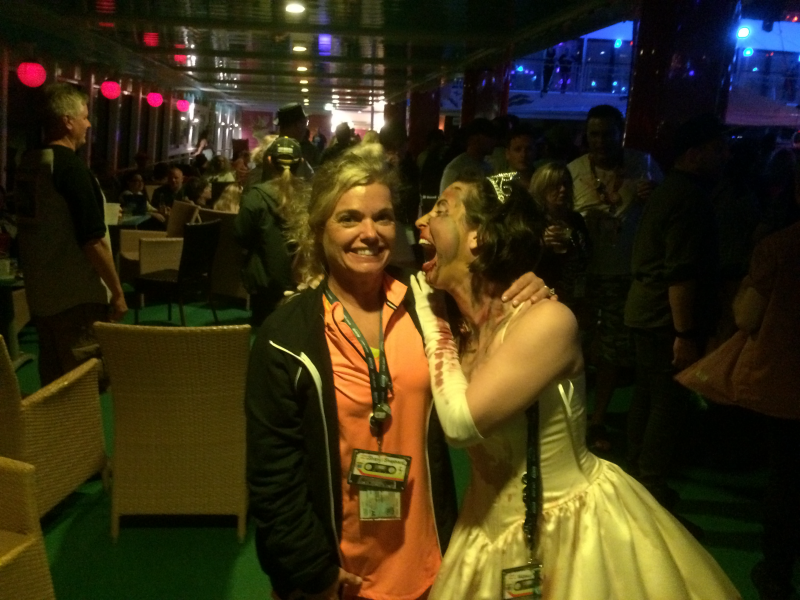 Boat passengers had the option to dress up like zombies. Many did. 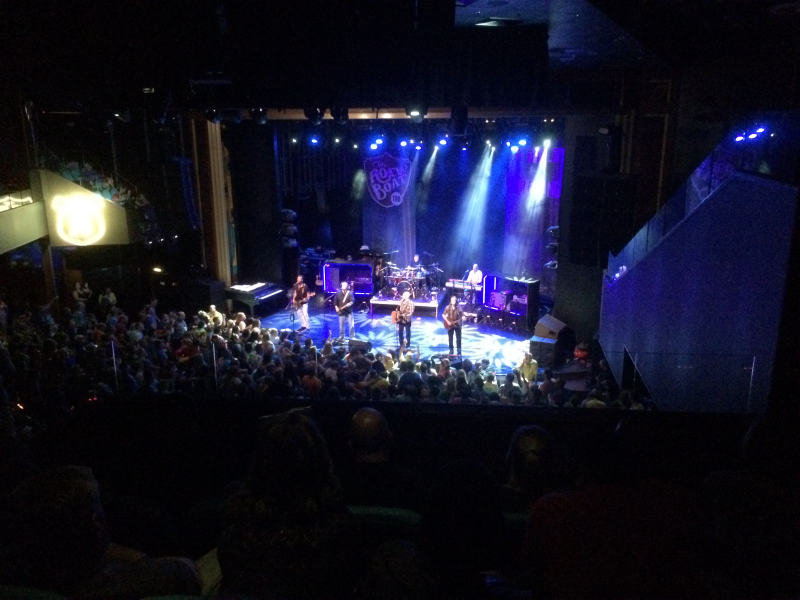 So did Sister Hazel who played an entire set of Tom Petty cover songs, all hits, in what they billed as "Zom Petty." It was great! 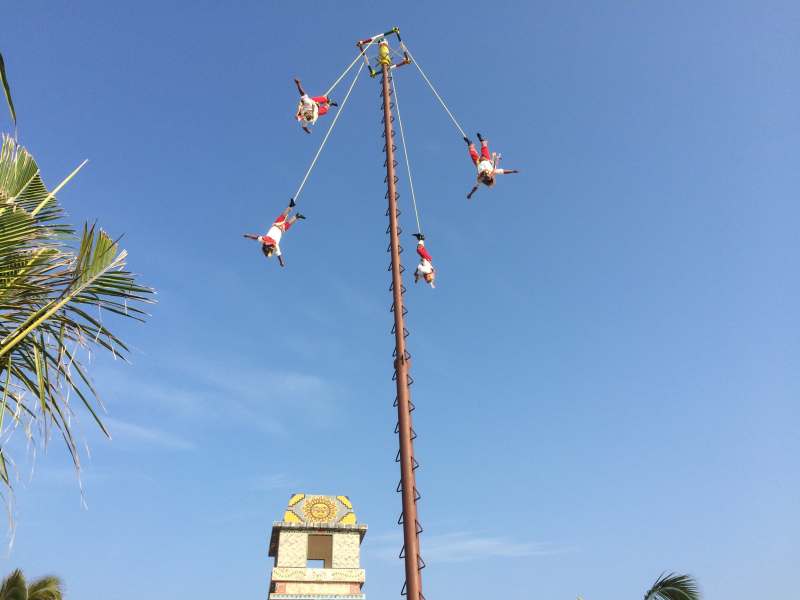 One thousand years ago, there was a great drought, so 4 Mayans (representing earth, fire, wind, and water) scaled the tallest tree and repelled down as an offering to the rain god. That ceremony is recreated on an hourly basis. 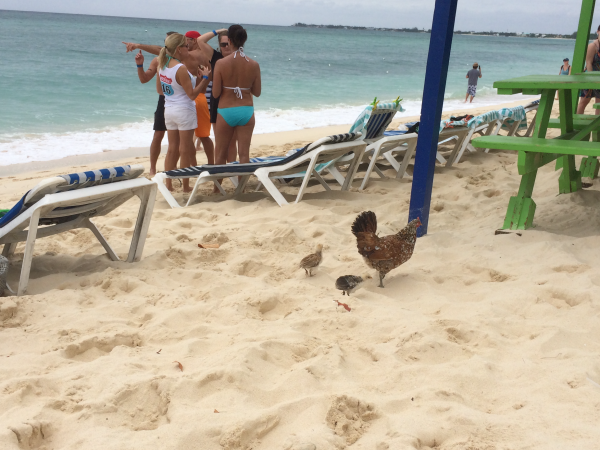 While docked at Costa Maya, we got off the boat for our excursions. Sheryl took a stand-up paddleboard class. Blake and Stephanie went to the beach. Rickey and Patti took a salsa-making class. 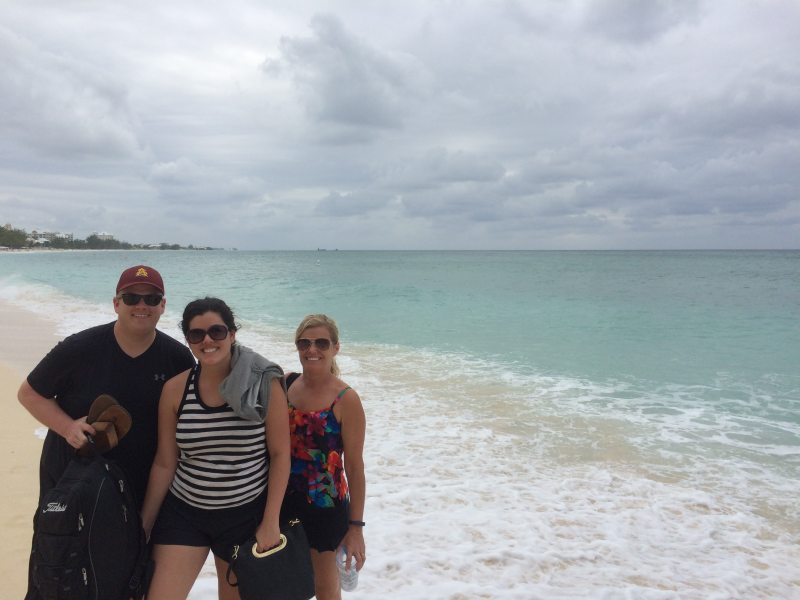 Tim, Marie, and I visited 1100-year-old Mayan ruins. 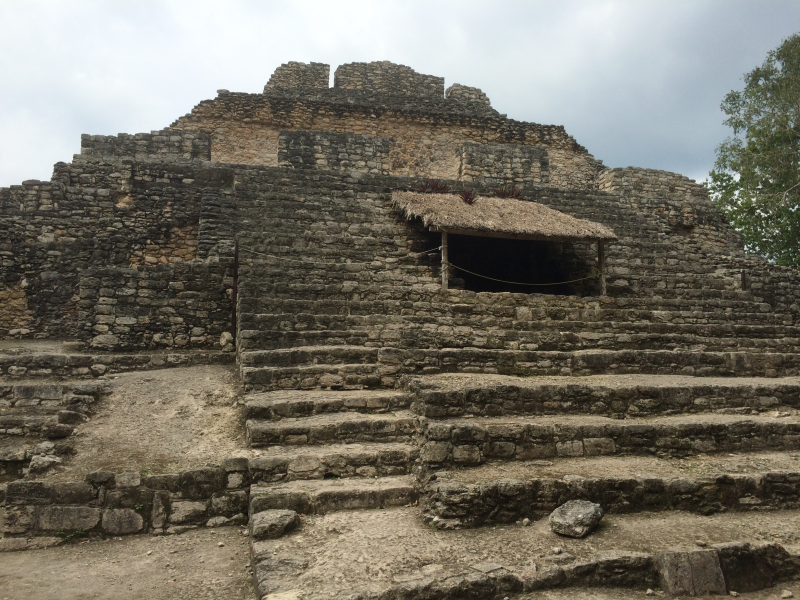 It was nice to learn about the history and culture of the Mayan people. 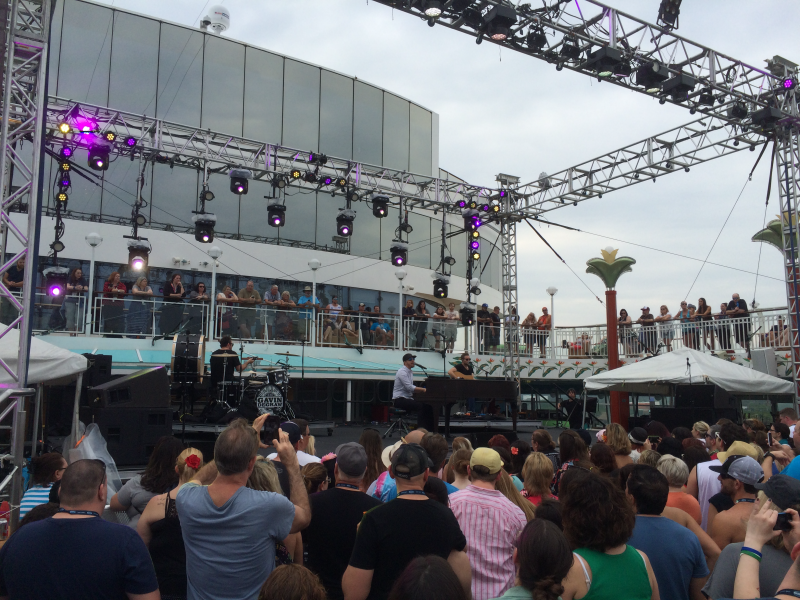 After our excursions, we gathered on the pool deck of the boat for Gavin DeGraw's acoustic performance. 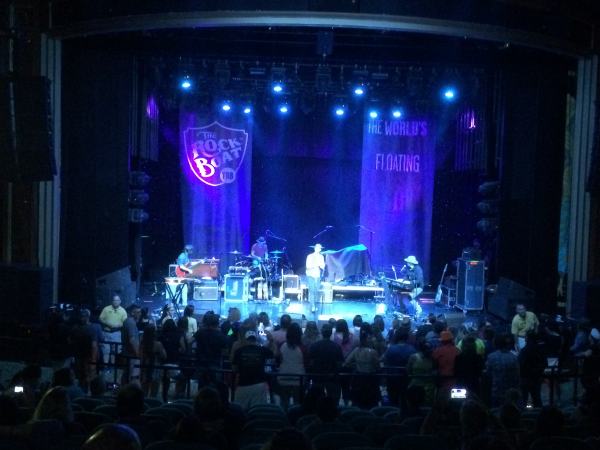 Unlike on opening night in the Stardust Theater, this DeGraw show lacked energy, so we didn't stay for the whole set. 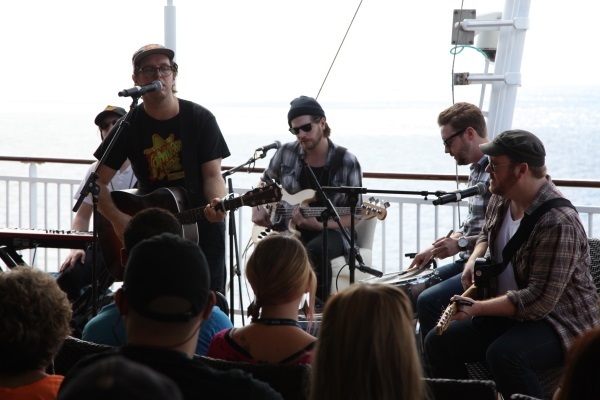 Melodime played an acoustic set on the very back of the boat. It was terrific. Two of their more popular songs include "Our Time" and "Halo." They played out on the pool deck. Their hits included "All For You" and "Change Your Mind." 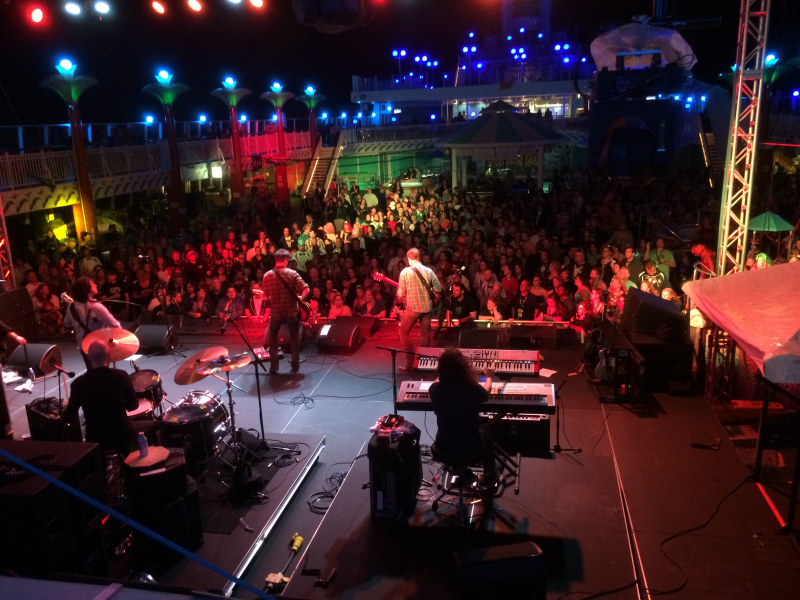 After 5 voyages, I have become familiar with this band. This is an eleven-piece band, so there's a lot going on. Their hits include "Rebecca" and "Haven't Seen For A While," but the show stopper was their cover of Peter Gabriel's "Sledgehammer." Though their hits are "The Spark" and "Letter," Wild Adriatic performed a set of Led Zeppelin covers in the bar area known as Bar City. 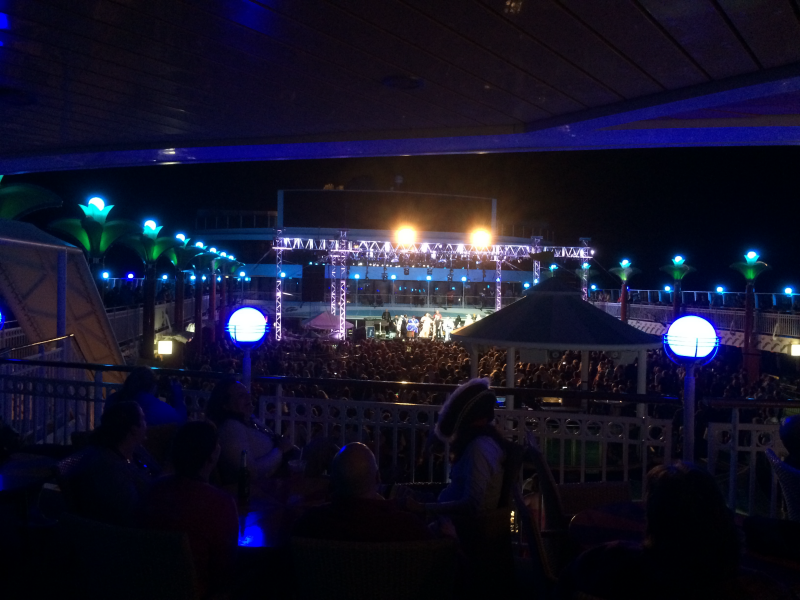 The place was so packed that we had to watch the show from the deck above. 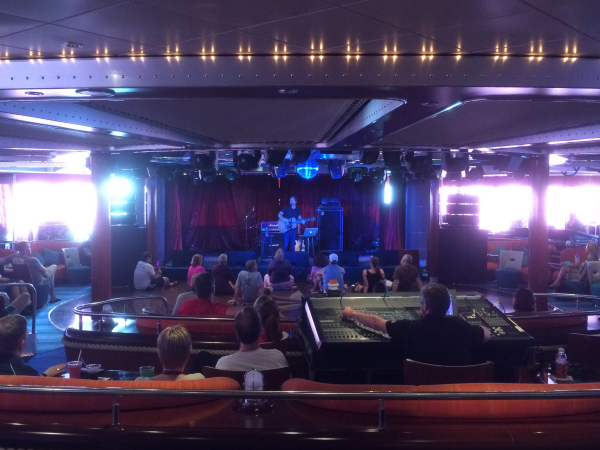 This was my favorite performance of the cruise. During this show in the Stardust Theater, they played "Lullaby" which is my favorite from their catalog. This band had an unusual sound with lots of variety; however, unfortunately, their cover of Led Zeppelin's "The Lemon Song" brought their set to a screeching halt. Their most popular song Spotify is their cover of "Hold On, I'm Coming." This band gets its name from the Confederate soldier rank, Brevet, which was a rank so low that the soldier was not paid. This band performs for their love of music — not the money to be made. Lead singer, Aric Chase Damm, is a Civil War buff. 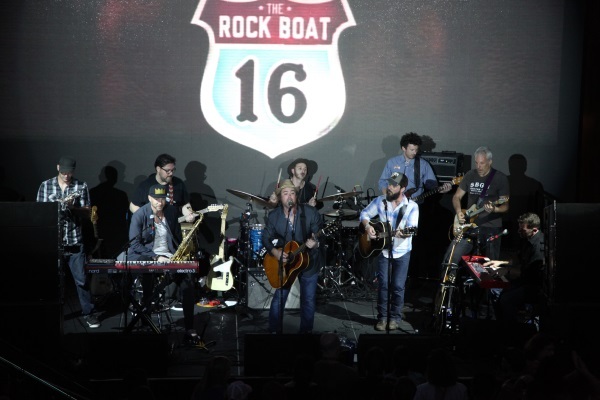 Rock boaters invited them on to the voyage by voting for them via a social media campaign. His high energy show included his biggest hit, "Strong," which you may have inadvertently already heard since it was used as the theme song in a 2014 Chevrolet Silverado truck TV commercial. 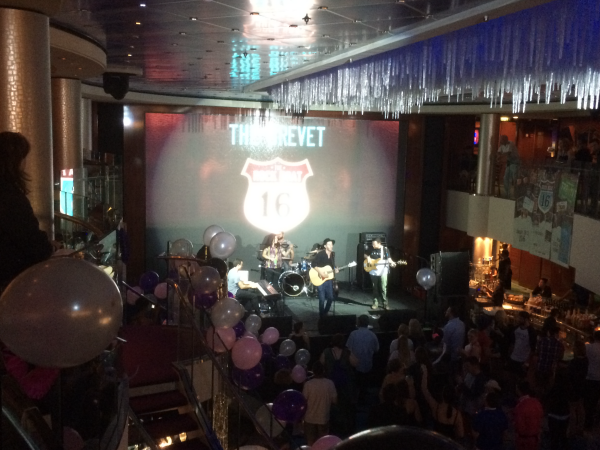 Sweet 16 Artists present "Prom Queen"
This was The Rock Boat's sweet 16th voyage. With a theme of "Prom Queen," various bands performed covers of Queen songs. In previous years, the theme/covers have included the Beatles and the Rolling Stones with great results. The bands butchered these songs. Alas, Brian May's guitar sound and Freddy Mercury's vocals just cannot be reproduced. 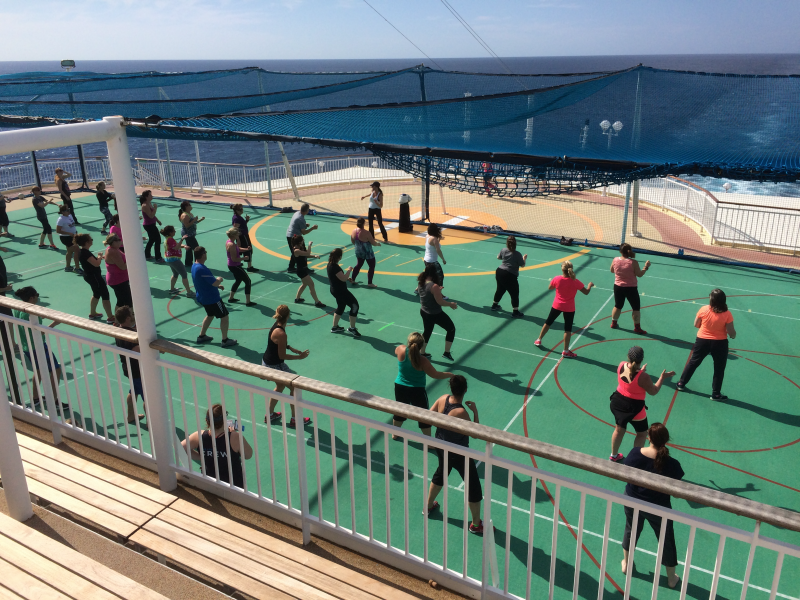 Sheryl started her day with a Zumba exercise class. The Trews rocked out poolside. Their most popular song is "Highway of Heroes" which is about a highway in Canada with memorials for fallen soldiers that align the roadway. Very moving. Based on Brandon Kinder's participation in the Sixth Man Session, we decided to check out his band's acoustic set. Their most popular songs on Spotify are "Viva Voce" and "On The Other Side." This was a very pleasing performance. 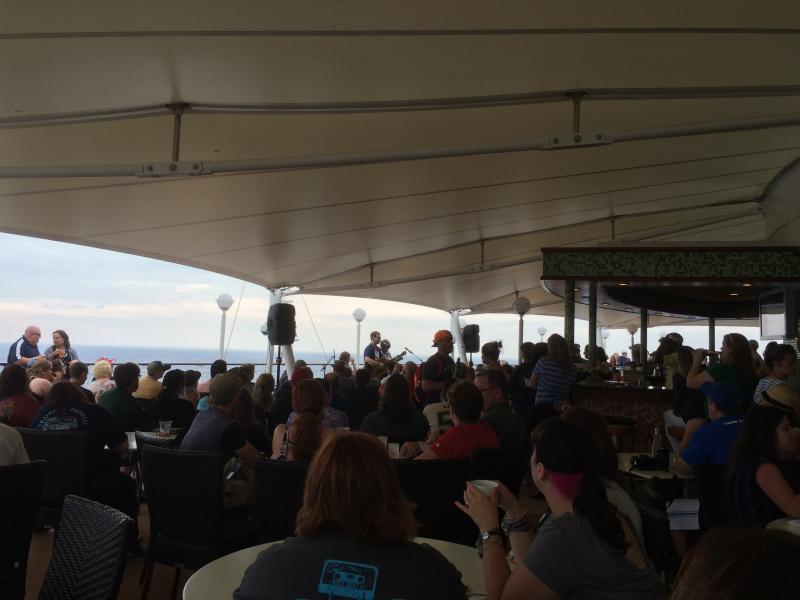 Emerson Hart had a great acoustic set on the back of the boat. His performance was interrupted by the smell of something burning (like an electrical burn), but the crew was able to extinguish the fire without incident. 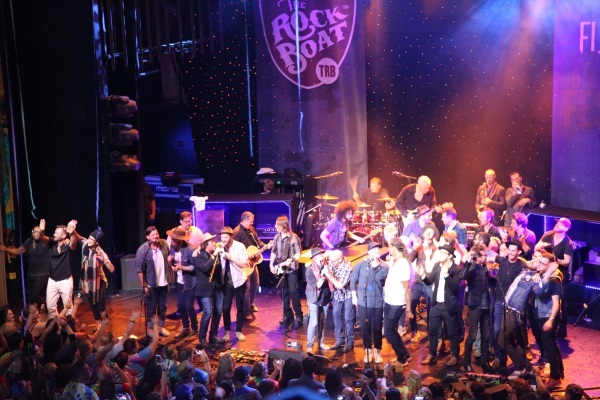 The finale included a set of mostly hits and ended with a cover of Jackson Browne's "The Load Out/Stay" — including bringing all of the roadies and behind the scenes people on stage (very fitting) as well as many of the other artists. They'll set it up in another town"
—"The Load Out," Running on Empty, Jackson Browne, 1977. Each show typically started on the hour or half-hour and lasted an hour. This year was uncharacteristic in that some of the shows started up to 10 minutes late. 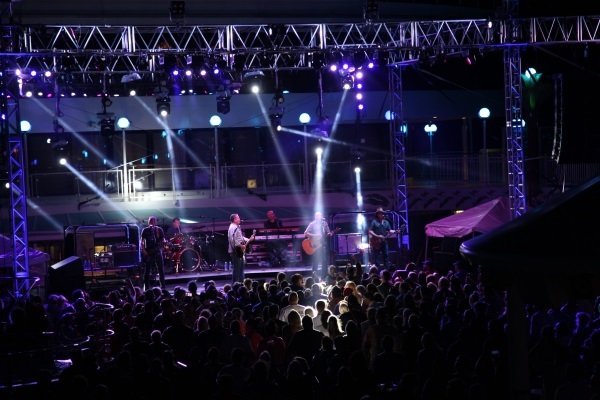 All shows were general admission and included in the cost of the voyage. There were typically 5 shows happening simultaneously at any given time. 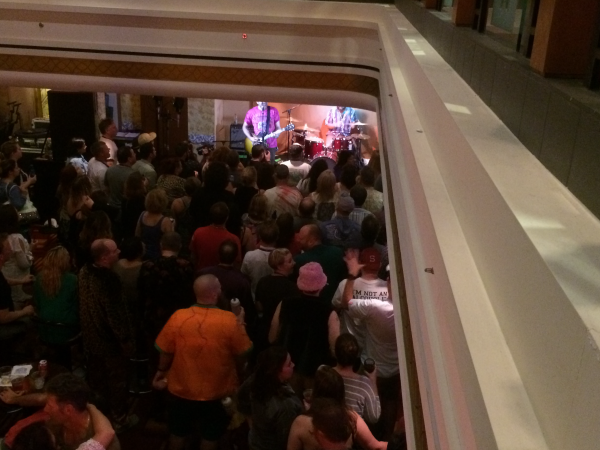 So you just walked over to a venue, sat down, and listened to a band. You could have staff bring you adult beverages while you watched/listened. 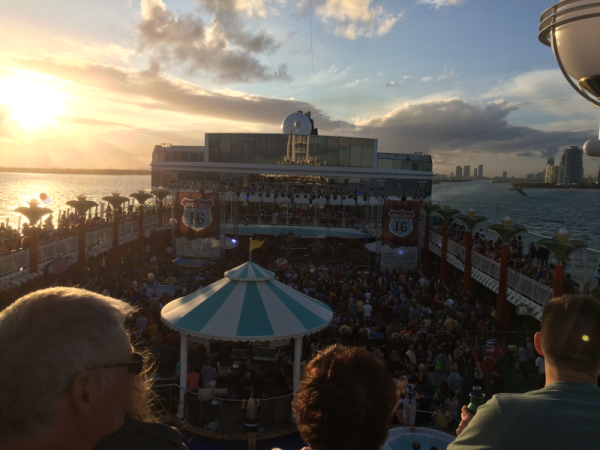 If a band was not to your liking, you could get up and walk over to another section of the boat and hear a different band. It was just that easy. I guess it's true what they say: "Great minds think alike." although this was not my favorite, a good time was had by all. It was especially great to be with family and friends I consider family. There's always next year. 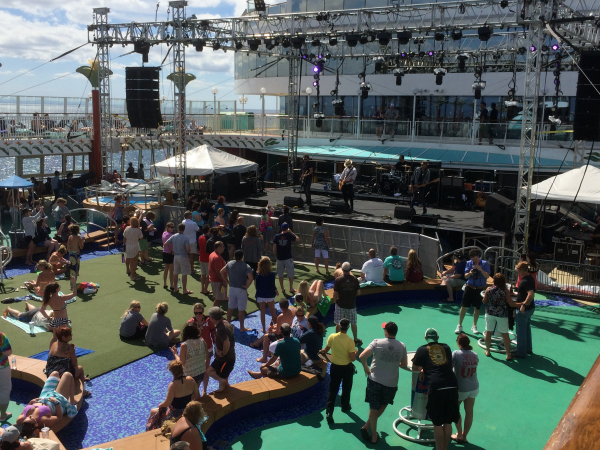 One suggestion I have is that The Rock Boat bands make Spotify play lists of their sets available so voyagers can become familiar with all of the songs they are planning to play. 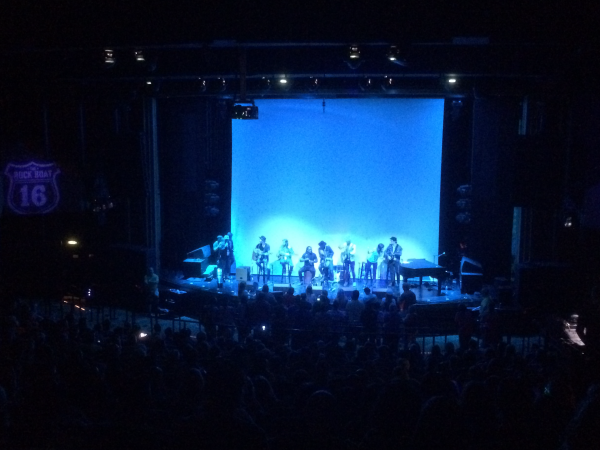 It was amazing how much more enjoyable it was when listening to live versions of songs that I had previously heard versus hearing something for the first time. Rockin' is alive in the lab.